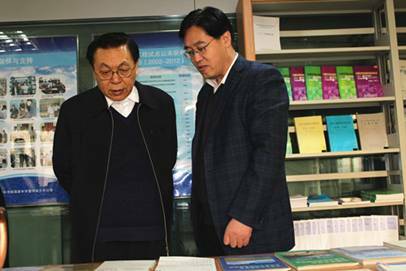 January 10, 2012—At the invitation of the Lanzhou Branch of National Science Library (NSL), the academician of the Chinese Academy of Sciences (CAS), Ouyang Ziyuan visited Lanzhou Brach. He is also the chief scientist of China's Lunar Exploration Project, the famous scientist in the field of astrochesmistry and geochemistry, and the researcher at the Institute of Geochemistry of Chinese Academy of Sciences. He was invited to make an academic report entitled “Reflections of Earth and Planetary Sciences Development”. 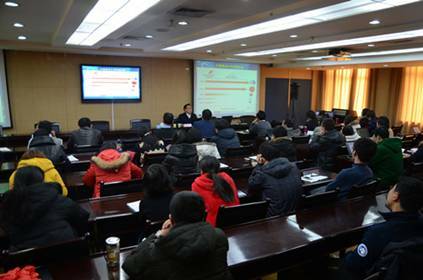 The report was attended by more than 80 researchers and graduate students from Lanzhou Branch of National Science Library, Lanzhou Institute of Chemical Physics, Cold and Arid Regions Environmental and Engineering Research Institute of CAS and other institutes. The researcher Zhang Zhiqiang, the curator of Lanzhou Branch of National Science Library, presided over the report meeting. 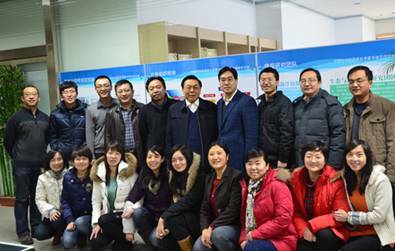 Before the report, the academician Ouyang Ziyuan, accompanied with the curator Zhang Zhiqiang, the secretary Ji Guilin and other leaders from Lanzhou Branch, visited the departments of Lanzhou Branch. He gave full recognition to the recent development of Lanzhou Branch and said that the work on the development vision, the actual work, the contribution and the achievement is all very prominent. As China further promotes the construction of ecological civilization, it is of great significance in strategic research service of resources and environmental sciences and scientific journals publishing. The academician Ouyang Ziyuan hoped that Lanzhou Branch will develop better and achieve greater targets in future. In the academic report, the academician Ouyang Ziyuan interpreted the major scientific issues and latest progress of contemporary earth science and planetary sciences development from several respects, such as the mainstream theory hypothesis of the origin and evolution of the Earth and its plight, the conditions of which the life exists on the earth, the scientific issues that the theoretical research of contemporary Earth sciences should concern about, and to meet the future challenges of Earth sciences and planetary sciences, etc. He pointed out that the birth of the inherits and contains the origin and evolution genes of solar systems, and the significant variations event in the evolution of the Earth profoundly affect and change the movement course of the Earth. He stressed that in the contemporary era of space, the combination and promotion of Earth and planetary sciences is the inevitable trend of the development of Earth sciences, and then to understand the origin and evolution of the Earth more profoundly, drive the breakthrough and development of high-tech, and promote leaping development of Earth Science. Finally, the academician Ouyang Ziyuan answered the questions raised by the audience patiently and carefully. This report presented a strong inspiration that the inevitable development of Earth sciences is to develop to planetary science. Scientists must achieve mastery to the relevant knowledge and establish a broad range of knowledge system which is the condition of query and innovation. It is the only way to realize the value for scientists to have strong science interest and research pursuit closely integrated with the national demand. The report is not only a special academic report from the high-level scientist, but also a report about scientific and cultural dissemination and science popularization.